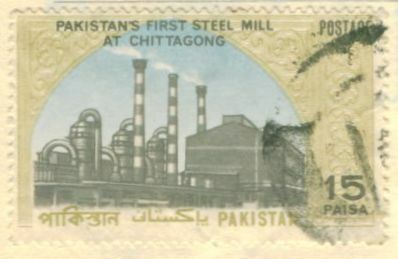 Chitagong, East Pakistan has the distinction of having on its soil the first steel mills of Pakistan. On the eve of its inauguration, Pakistan Post issued a 15 Paisa stamp showing the building of the steel mills on 7 January 1969. Pakistan Post issued a 15 Paisa stamp on the theme of Family Planning on 14 February 1969. The purple and blue stamp ironically coincided with the Valentine's Day. Pakistan rose to prominence in the field of hockey when it bagged its first Olympic gold in the 1960 Rome Olympics, but lost the title to India in 1964 Tokyo Olympics. The 1968 Olympics at Mexico thus become important for Pakistan to regain the lost title. The team under famous Olympian Tariq Aziz worked very hard and clinched the title from India and became the Olympic champions in hockey. India finally settled for a bronze. The honour coincided with the on-going celebrations of the Decade of Development by the then regime of president Muhammad Ayub Khan. The president immediately sent a telegram to the skipper in which he said, “I heartily congratulate you and all members of your team on their grand victory in the Olympic Championship. This is a tribute to your team spirit, dedication and skill. Pakistan is proud of your superb performance." To commemorate the glorious victory, Pakistan Post issued a set of two stamps on January 30 as shown above, valued Paisa 15 and Rupee 1. 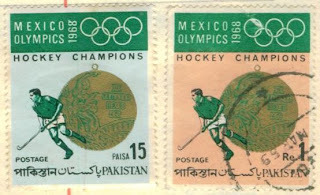 The stamp showed the Olmpic gold medal and a hockey player with the caption of Mexico Olympics 1968 alongside the Olympic rings. On the eve of the death centenary of the famous Urdu language poet of the united India Mirza Asad Ullah Khan Ghalib, Pakistan Post issued a set of two stamps of value Paisa 15 and 50. 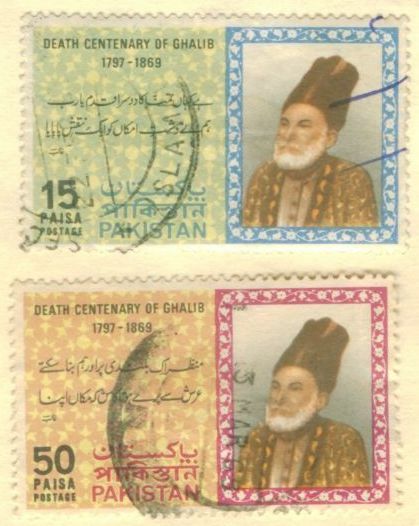 The stamps bore the typical portrait of Mirza Ghalib on the right enriched with Moghul floral border and a selection of verses from his poetical masterpiece. The above stamp valued at Paisa 15 showing the new railway station of Dacca was issued on completion of its first year on 27 April 1969. 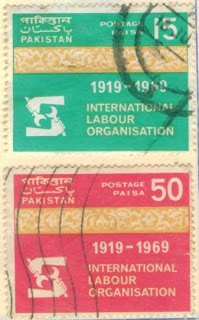 A set of two stamps, valued at Paisa 15 and 50 was issued on the eve of 50 years of the International Labour Organization ILO. The stamps green and red in colour were issued on 15 May. To mark the Fifth Anniversary of the establishment of the Regional Co-operation for Development (RCD), the Pakistan Post Office issued a set of three commemorative postage stamps of 20 Paisa, 50 Paisa and Re. 100 denominations on the 21st July, 1969. The stamps reflected the cultural heritage of the three member countries. The 15 Paisa stamp on left above had the reproduction of a Mughal Miniature painting belonging to the mid 18th Century. The painting depicted the portrait of a woman seated in a balcony, holding a cup in her hand and wearing a tall bejeweled hat on her head, from which her hair cascaded on her shoulders. The stamp reflected the art of Pakistan. The 50 Paisa stamp in the centre above depicted the Safavi miniature art of Iran, showing a kneeling servant. The painting was done by Raza Abbasi who lived in the first half of the 17th Century and was one of the well-known Safavi (Isfahan) miniaturists. 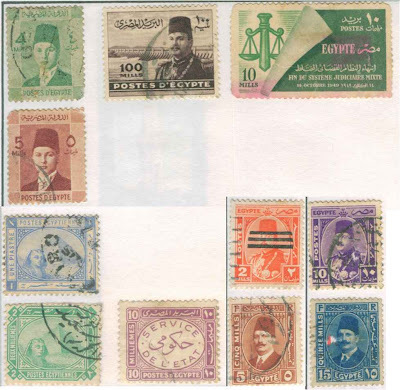 The Rupee 1 stamp on the right above showed the miniature art of the Ottoman Empire's times and displayed the Suleiman the magnificent's court. The miniature seems to have been taken from “The Book of Exploits”compiled in the year 1588. On the eve of the commissioning of the first oil refinery in East Pakistan, a commemorative stamp of value Paisa 20 was issued on September 14, 1969. The refinery named Eastern Refinery Ltd., was been built in collaboration with the East Pakistan industrial Development Corporation and the Burmah Oil Company Ltd., London. Built at a cost of Rs. 13.5 crores, the Eastern Refinery had the designed capacity to process 1.5 million tons of crude oil annually. This was yet another hallmark of the Decade of Development of president Ayub Khan. 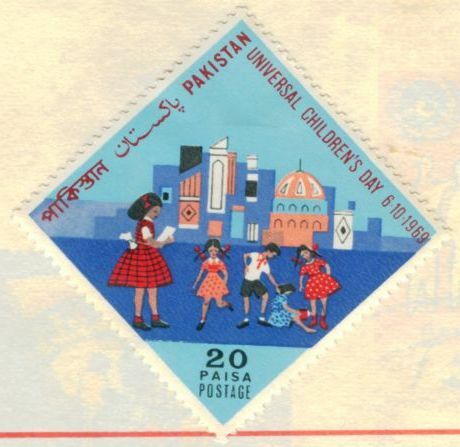 The above stamp of 20 Paisa denomination was issued on 6 October on the eve of the Universal Children Day. A set of two stamps was issued on November 1, 1969 on the occasion of inaguration of the Dacca - Tokyo route, labelled the Pearl Route by the national flag carrier Pakistan International Airlines (PIA). The stamp valued Paisa 20 (green in colour) and Paisa 50 (blue in colour) showed a Japanese doll on the left side of the stamp against the three panelsn. 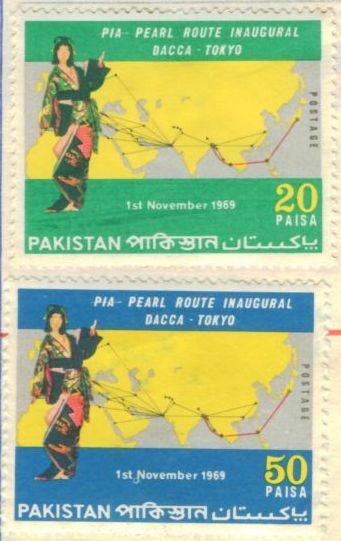 The top panel bore the caption “PIA PEARL ROUTE INAUGURAL DACCA-TOKYO”, while the lower panel showed the value of the stamps. The central panel displayed the map of the world with black lines marking the diferent destinations of PIA. The route was labelled as Pearl Route for the reason that Dacca is known for its pink pearls and Bangkok for precious stones. Manila is the capital of the Philippines which is called the Pearl of the Pacific and Tokyo is internationally famous for its cultured pearls. The name of Abu Ali Al Hasan ibnul Hasan ibn al-Haitham (Alhazen) for his monumental achievements in the science of optics is well known around the world.Born in Basra in 965, he moved to Cairo which was then the hub of the Islamic world and a great centre of learning. His brilliance in the field of mathematics was picked up by the Fatimid caliph and was called to the royal courtyard. Haitham had many contributions including the proposal of building of a dam on River Nile that would create destruction each year around its banks. It was many centruies later that the famous Aswan Dam was built and relaised Haitahm's dream and brilliance. However his greatest discoveries are in the field of ptics and he wrote a book "On Optics" or Kitabul Manazir. In the book, he came up with the thoery of Euclid and Ptolemy that the eye sends out visual rays to the object of vision. He proposed, “It is not a ray that leaves the eye and meets the object, that gives rise to vision. Rather the form of the perceived object passes into the eye and is transmitted by its transparent body (i.e. the lens)." His contributions in science are countless which require thousands of pages to fathom each. 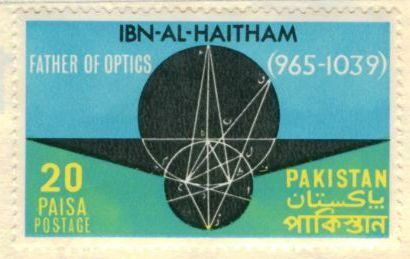 On the eve of the 1000th anniversary of Ibn-e-Haitham, Pakistan Post issued a stamp of Paisa 20 value on November 4, 1969. The multicoloured stamp bore his theory of Reflection of Light, drawn by him. The last stamp of the year was issued to commemorate the 50 years (1919-1969) of the first aeroplane flight from London - Australia on 2 December 1969. The mainly blue coloured 50 Paisa stamp showed the famous Vickers "Vimmy" aircraft and the route of the first flight showing London - Karachi (now in Pakistan) and Darwin in Australia, the end destination. It may be added here that in March 1919 the Australian Government had offered a prize of £10,000 for the first aeroplane to fly from England to Australia. The race was won by the “Vickers Vimy biplane commanded by Sir Ross Smith, with his brother Lieutenant Keith Macpherson Smith as co-pilot and mechanics Sergeant W.H. (Wally) Shiers and J.M. (Jim) Bennett, who took off from England on November 12, 1919 and reached Australia on December 10, 1919 after making brief stop-overs at various places including Karachi. in 1968 Olympics picture is the legend of Field hockey ASAD MALIK. is at Facebook now by this address. I can see the hardwork done by the blog owner.Keep Posting such great things again.Looking forward for your next post.